Boon is one of our favourite brands over here. Everything they make seems so practical and stylish so here’s another sneak peek at some new products being released world-wide very soon. I saw a few of these at the ABC trade show last September in Las Vegas but now have some more details to share. The Grass Drying Rack from our trade show coverage is already in Australia but the Curl Baby Shoe Rack and the Grip hooks (formerly Snag) are coming very soon! We only have packaging shots at this stage but I’ll get my hands on these for testing as soon as they hit our shores and will give you a full review with pricing and retailer details. 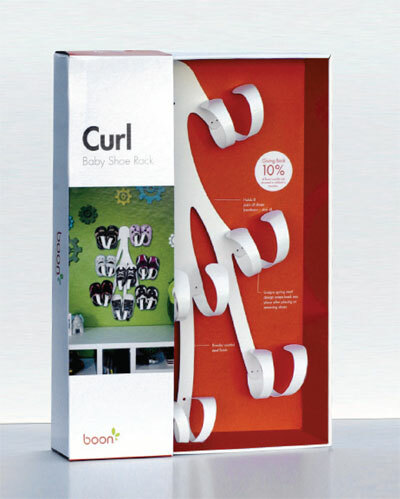 I fell in love with the Curl Baby Shoe Rack the minute I saw this one. It’s the perfect way to store those many, many pairs of gorgeous shoes we all buy for our little ones. How adorable will baby booties, Pumas, pre-walkers, sandals and other footwear look displayed on this shoe rack. It attaches straight to the wall (mounting hardware included) and can hold eight pairs of shoes from newborn to size four. The unique spring steel design snaps back into place after placing or removing shoes. I love it! 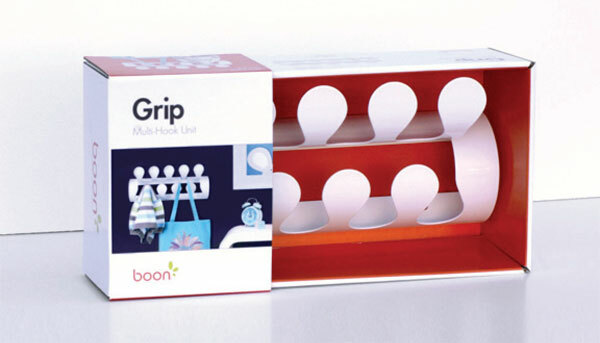 The Grip multi-hook unit (pictured top) comprises two rows with nine hooks in total. The is perfect for hats, bags, umbrellas or jackets and will look stunning in any child’s room, the lounge, beside the door or anywhere in the house. As a huge organiser myself, I think I’ll have to buy a couple of these to organise my household. I’ve been waiting for the perfect solution, and I think Boon have got this one sorted. 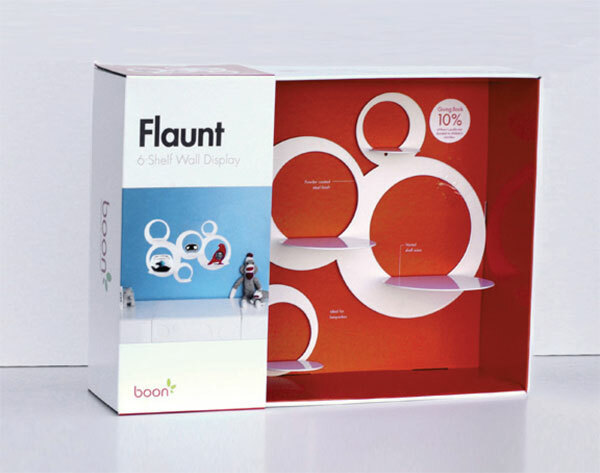 The Flaunt three or six shelf unit is the perfect nursery display cabinet. Whether for soft toys, books or keepsakes, this will add style to any nursery. These images are all we can get our hands on for now but we’ll have more details and photos as soon as they are available and I’ve road tested them for you. We hope you like what you see! We have featured many Boon products in the past so check out some of the other items in the range currently available in Australia from Urban Baby. This range is being released 1 August 2010 but we hope to feature them here a few weeks earlier and will let you know as soon as that’s confirmed.